As advocates for medical marijuana looked on, the Springfield City Council approved a host community agreement to open the first medical marijuana dispensary in the city. The way is clear for the first medical marijuana dispensary to open in the largest city in western Massachusetts. A development agreement leaves open the possibility of additional sites for medical cannabis in Springfield. The Springfield City Council Monday night unanimously approved a host community agreement with Hampden Care Facility Inc. that will allow the Chicopee-based company to seek a state license to operate a medical marijuana dispensary in East Springfield. The action came four years after Massachusetts voters authorized medical marijuana and a week after Question 4 was passed to legalize recreational marijuana. Advocates for a medical marijuana dispensary in Springfield, who filled the audience section in the City Council Chambers, applauded after the vote. Nichole Snow, Executive Director Massachusetts Patient Advocacy Alliance, said she was greatly relieved for people in Springfield who depend on marijuana to ease their ailments. "Access in the western part of the state is very scarce, so having this ( dispensary) is very important for the city of Springfield and for western Massachusetts patients," said Snow. The legalization of marijuana for all adults to use in Massachusetts won’t negate the need for medical marijuana, according to advocates. The only medical marijuana dispensary in western Massachusetts opened in Northampton a little more than a year ago. Springfield’s first medical marijuana business is expected to open late next year. The agreement approved by the city council would make it possible for additional dispensaries to seek permits to operate in Springfield. A prior agreement, which the council rejected by an 8-3 vote in August, would have granted Hampden Care a five-year exclusive license. City Councilor Adam Gomez, who chairs the council’s Health and Human Services Committee, believes one medical marijuana dispensary in Springfield will not be enough.
" We know that these businesses thrive when their is competition," said Gomez. Under the terms of the host community agreement negotiated by Hampden Care and the administration of Mayor Domenic Sarno, the company will pay the city 1.5 percent of its gross sales revenue for the first year the dispensary is in business. The annual payment rises to 2 percent the second year and to 2.5 percent in all subsequent years. Additionally, the company is obligated to pay the police department $50,000 annually and make separate payments to the city of $50,000 in the first year, increasing to $100,000 in the second year, and $150,000 annually in all subsequent years. Frank Antonucci, an attorney for Hampden Care, said the terms of the agreement are subject to renegotiation if the city chooses.
" There is flexibility for the city to revisit this issue if for some reason it is beneficial for them," he said to the council prior to the vote. The proposed dispensary is planned for an existing commercial building in an area of the city that is zoned for light industrial purposes. Kathleen Brown, President East Springfield Neighborhood Council, said her organization endorsed the plans for the dispensary.
" Its been a discussion in the neighborhood for quite some time and we've had three or more meetings," said Brown. " The people felt it was an appropriate location if appropriate safeguards were in place." The Springfield Police Department approved a security plan for the dispensary that includes a high fence around the parking lot, exterior lighting, surveillance cameras, and an alarm system linked directly to police headquarters. Voters in Massachusetts overwhelmingly approved legalizing medical marijuana in 2012. But many local communities are putting temporary bans in place as the deadline for final applications for state licensed marijuana treatment centers approaches. About a third of the state’s 351 cities and towns have put in place moratoriums on medical marijuana treatment centers, according to the Massachusetts Attorney General’s office. Springfield is the largest city in the state to adopt a moratorium. It was approved by the city council Monday night. 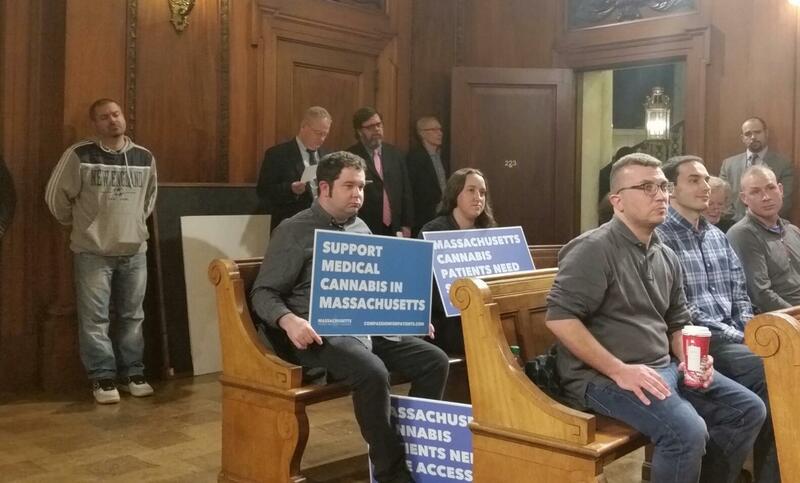 Massachusetts marks a milestone of sorts today in the availability of medical marijuana. The first dispensary in the city of Boston is scheduled to open. Connecticut wants its hospitals, universities and licensed marijuana producers to study the drug's medicinal qualities. The opening of the first medical marijuana dispensary in Springfield – and just the second in all of western Massachusetts – is being delayed as city councilors review the terms under which the proposed facility would operate.